A good makeup steal is the stuff dreams are made of. Sometimes a splurge is in order, but most of the time I head to the drugstore for my beauty products. From mascara to foundation, I find the best products actually do come cheap. When it comes to scouting out the best drugstore foundation, there are a few things to keep in mind. Make sure your chosen foundation provides significant coverage without caking or smudging, and look for a formula with moisturizing benefits and antioxidants. Since it’s the base for the rest of your makeup you want to ensure that it hydrates your skin and won’t leave it dry and flaky. Another must? Non-comedogenic formulas that won’t clog your pores, but still hide imperfections. The foundations below boast these benefits and more, each of them unique in their own way. L’Oréal’s Visible Lift Blur Foundation contains opti-blur technology that works to cover any skin woes. NYX High Definition Foundation uses light diffusing technology to enhance the appearance of silky, smooth skin. Neutrogena’s mineral foundation contains time-released antioxidants that nourish the skin, plus the purified pressed minerals will leave you with an even, glowing complexion. Rimmel and Revlon have both released formulas with 24-hour coverage, ensuring your foundation stays put from day to night. Perfect for the days where you have no time to freshen up, the long-lasting foundations lend a generous hand. And with a moisturizing complex praised for hydrating even the driest of skin, Sonia Kashuk’s Perfecting Luminous Foundation will replenish and brighten your complexion. If you’ve been weary of buying drugstore foundation, you can rest assured you’re in good hands. I’ve never bought a foundation that was over $20 and my skin is far from flawless. These 10 drugstore foundations are sure to get you on board. This oil-free formula ensures your face is shine-free all day, while still providing you with ample coverage. The light-weight formula blends easily and is buildable without clogging your pores. Available in 12 different shades, your complexion is sure to look just perfect. For natural coverage that won’t look caked on, L’Oréal’s foundation works for all skin types and has the added benefit of anti-aging properties. It has an opti-blur technology and is non-comedogenic, hiding imperfections without blocking your pores. You only need a small amount to cover your face, and with SPF 18, you can use it without a sunscreen base for days with minimal sun. Rimmel’s foundation prides itself on staying put from day to night, with a finish that lasts up to 25 hours. The long-wear foundation is combined with comfort serum so your skin feels soft and comfortable all day long. The lightweight formula provides the skin with instant hydration, and vitamin E provides a skin barrier for free radicals. This foundation is where it’s at! Not only will it match your skin tone, it also works to fit your unique skin texture issues. Whether you have dry, normal, or oily skin, it will match your skin type and blend evenly on your face. The foundation contains blurring micro-powders that absorb oil and minimize your pores for a flawless finish. If you’re in the market for a heavy duty foundation that works well but won’t break the bank, NYX High Definition foundation is the one for you. It’s great for sensitive skin, so it shouldn’t cause break outs, plus it uses light diffusing technology to enhance the look of smooth skin. Use it throughout the day or for a night out! With a 24-hour long lasting formula, this foundation won’t budge from day to night. As the name highlights, it was made especially for combination/oily skin and offers medium to full coverage. Another thing that makes it so special? It uses Time Release Technology to get oil and shine under control. It’s a liquid foundation that will keep your complexion flawless all day. This foundation will even out and perfect your complexion with its ultra-hydrating formula. It’s infused with a moisturizing complex that will lead to brightened, luminous skin. With a layer of this creamy foundation, your skin will be replenished and your skin tone will have a natural finish. At such a low price point, you really can’t go wrong. If you’re not a fan of liquid foundation, Neutrogena’s purified mineral formula works just as hard. The pressed powder creates an even and glowing complexion and contains time-released antioxidants to nourish your skin. It features extra soft and blendable pressed minerals so you can choose your desired coverage. It’s oil and fragrant-free, and the minerals used in the formula were selected by dermatologists, so you know they’re good. This formula does double duty, acting as both a foundation and concealer. Combat under-eye circles, eliminate redness and get glowing skin all in once. The no-drip pump will dispense the perfect amount of product to flawlessly cover your skin, and with 14 shades to choose from, you can easily find your match! This foundation has so many amazing benefits packed into a cute little bottle! It’s formulated with polymer to lift and firm the skin, and contains a brightening complex to give your complexion a boost. Plus, the Pro-retinol complex contains Lipopeptides that enhance the skin’s elasticity. It’s also packed with antioxidants and vitamins to help fight free radicals and minimize pores and pigmentation. You don’t have to splurge when it comes to buying a hard-working foundation. You can find ones at the drugstore that provide just as much coverage and make your skin glow. Try these ones out to see for yourself! Your wallet will thank you. 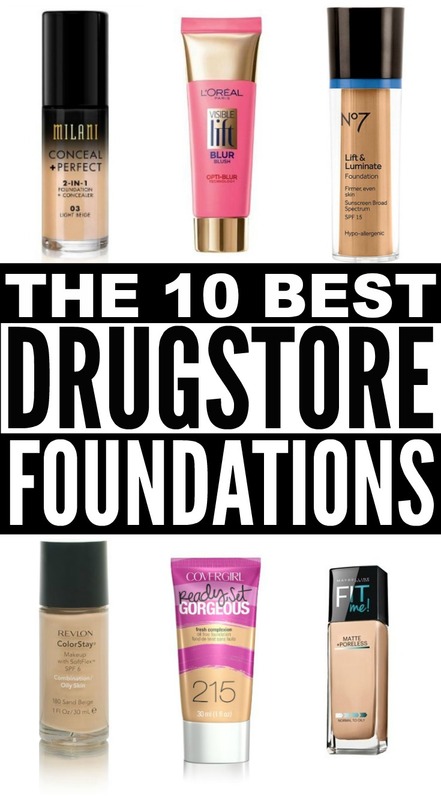 If you found this collection of the best drugstore foundation picks, please share it on Pinterest! And if you’re looking for more beauty-related tips and tricks, please follow our Beauty board where we share all kinds of fabulousness!